A humoristic adventure game with a classic point-and-click interface. It was developed by Daedalic Entertainment, a studio that specializes in this genre. 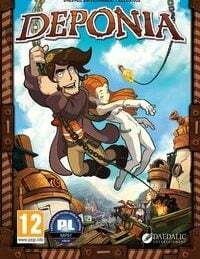 Deponia for PC, PS4 and etc. is a humorous adventure game with a classic point ‘n click interface. Its developer, the German studio Daedelic Entertainment, specializes in this genre. To cut a long story short, the game’s plot focuses around comedy resulting from the most improbable love story ever told in a video game. Deponia is meant for the fans of Douglas Adams, Terry Pratchett and Matt Groening, providing a good dose of laughs. The eponymous Deponia is a planet, covered with heaps of trash and garbage. The protagonist, a man named Rufus, is among its inhabitants; he's incredibly hotheaded and an egoist. Furthermore, he is not the most altruistic kind of guy and his only dream is attaining wealth and living a prosperous life in one of the floating cities, hovering high above the surface of this detestable planet. One day, a beautiful woman named Goal comes falling down from one of those cities. Thus begins an adventure that quickly turns out to be something more than just a simple task of walking the lady home. What destinguishes Deponia for PC, PS4 and etc. among many other productions, are its visuals - hand-drawn and remarkably pretty. Many of the game's locations were created with their appearance designed to align with the general concept of this bizarre world, including a village cobbled together in the middle of a trash pile, “floating” black market or a hovering planetary railway. The below, unofficial guide provides a complete walkthrough of Deponia, a game created by Daedalic Entertainment. This game is a classic, point&click adventurer, which requires clear facts and situations, in which his character will find himself.